The highest grade of fused 3/4" melamine is used in the construction of the Raxxess 12 Elite Rack with 20" Depth, Model ERK-12-20B Ebony. This rack comes with a standard 11-gauge steel rackrail and top-quality knockdown furniture hardware. Clear off your desktop and store your A/V and production equipment anywhere you need it-out of sight or just in view. With the 4U/14"D rack, rack equipment gets the optimal space and sturdiness it deserves. Raxxess makes quality support equipment for audio, office or computer needs. Data and telecommunications needs are well-served as Raxxess produces high-quality floor and rack mounted solutions for cable management. Whether it is a guitar holder, cable depot, music stand, utility shelf or a place to hang your headphones, you can count on Raxxess to have the answer for you. 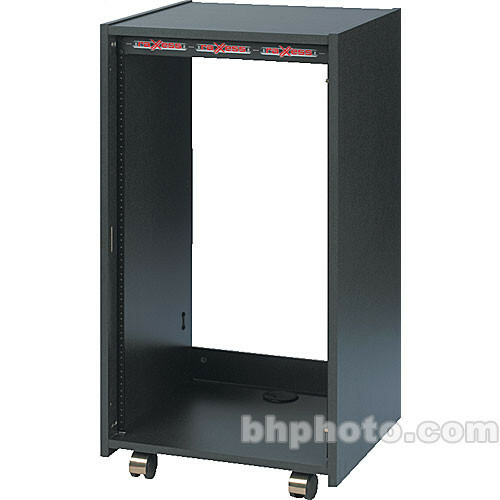 Elite Rack, Model ERK-12-20B Ebony is rated 4.8 out of 5 by 4. Rated 5 out of 5 by JT for CC from Nice sturdy rack I bought this to consolidate a home network that was turning into too many boxes and add a rack mounted server and switch. It is well built and assembled easily, using Ikea-like cams for the sides and woodscrews for the racks and casters. (The directions are a bit simplistic and you need to be careful to find the pilot holes which are the tiny hard to see pre-puched holes to screw in the rails). It has a nice black/grey finish. Casters are big,secure, and wheel nicely. All in all a very good 1/3 (12u/44u) rack. I considered an SKB portable but this was cheaper, looks better and I don't need to move it other than wheel it around. I'd buy another in a heartbeat. Rated 5 out of 5 by Necos117 from Met all of my needs! This is being used as a QA station with multiple machines connected via DVI KVM switch. Very easy to build, very sturdy, & looks great! The wheels make it very portable. Rated 4 out of 5 by Mr. Bee from Rack Model ERK-12-20B In spite of the poor instructions, we eventually assembled the rack. We had no problem installing our audio equipment. Looks good too. Rated 5 out of 5 by Loud One from Nice and sturdy rack I originally purchased the rack due to it's height to fit under my desk to hold my rack synths. Due to it's strength and depth I am able to roll it out and put tabletop gear on it as well. I will definitely purchase another in the future.